Satie was a colourful figure in the early 20th century Parisian avant-garde. His work was a precursor to later artistic movements such as minimalism, repetitive music, and the Theatre of the Absurd. 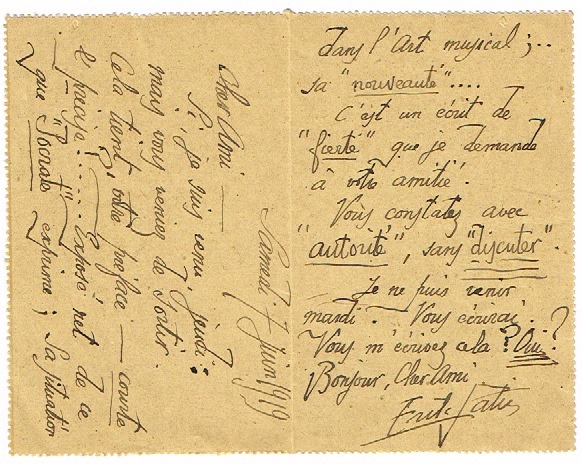 From 1919, Satie was in contact with Tristan Tzara, the initiator of the Dada movement. He became acquainted with other artists involved in the movement, such as Francis Picabia (later to become a Surrealist), André Derain, Marcel Duchamp, Jean Hugo and Man Ray, among others. In addition to his body of music, Satie also left a remarkable set of writings, having contributed work for a range of publications, from the dadaist 391 to the American culture chronicle Vanity Fair. French composer (1866-1925). 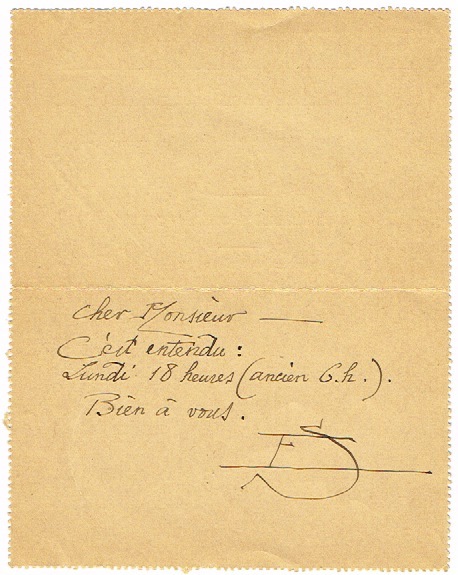 Autograph letter signed „ES“. No place. 8vo. 1 page. 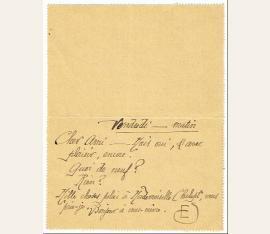 Invitation of Satie for his friend the writer René Chalupt (1885-1957): „Venez donc m’entendre: vous me ferez plaisir. Vous viendrez. Si Mademoiselle Chalupt venait avec vous, ce me serait une grande joie. Comment va? Je travaille comme un veau […]“. French composer (1866-1925). 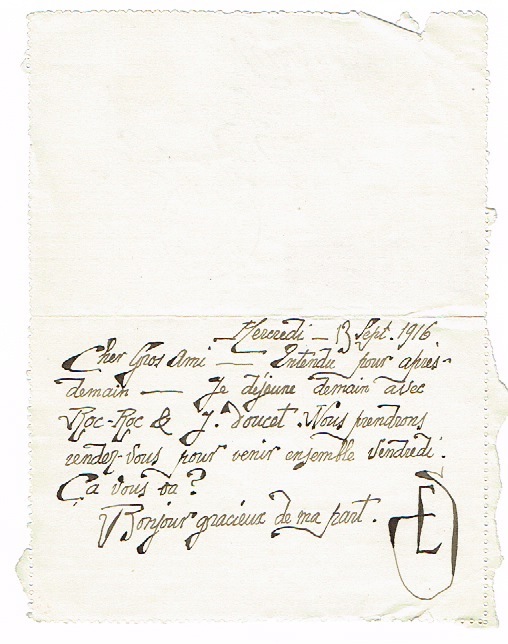 Autograph letter signed „ES“. 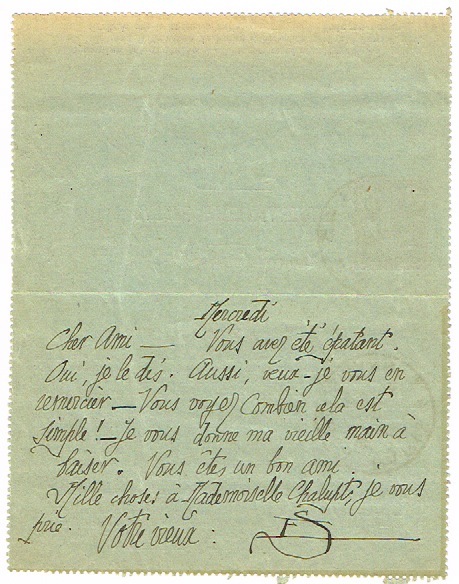 [Paris]. Small-8vo. 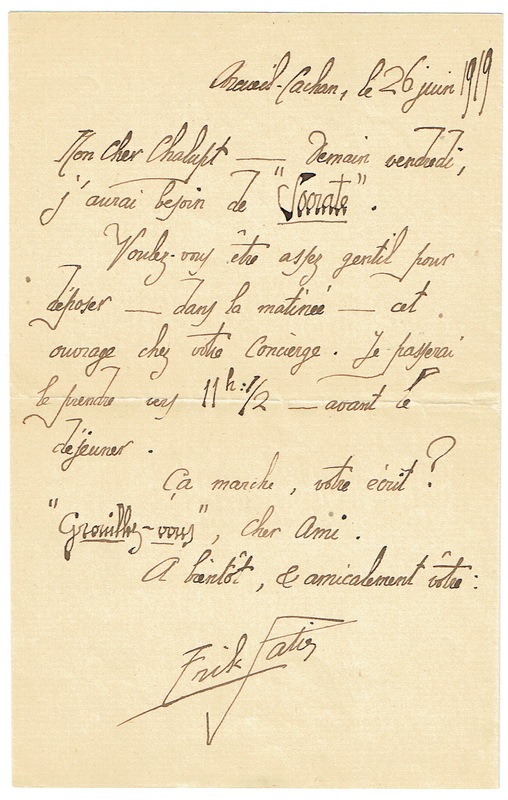 1/2 p.
To his friend the writer René Chalupt (1885-1957): „Merci de ce que j’ai trouvé dans le truc fermé mis dans votre joli écrit. 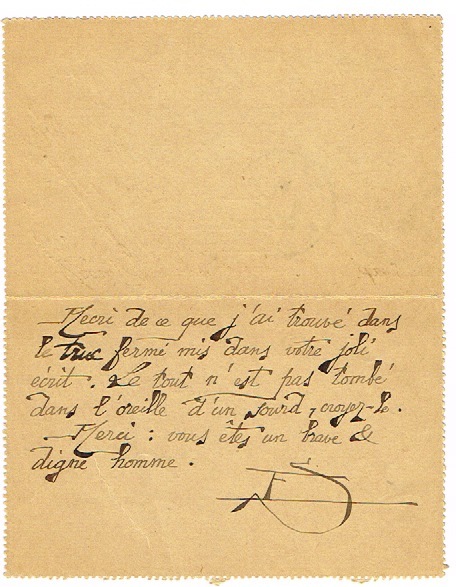 Le tout n’est pas tombé dans l’oreille d’un sourd […]“. French composer (1866-1925). 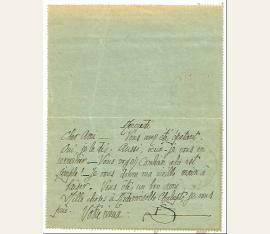 Autograph letter signed „ES“. Arcueil. 8vo. 1/2 page. 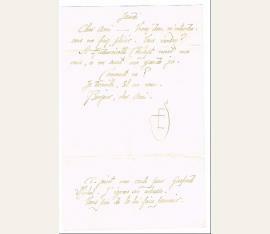 To his friend the writer René Chalupt (1885-1957): „Entendu, cher ami; mais pas avant 21 h. 30 (anien 9 h 30, du soir). 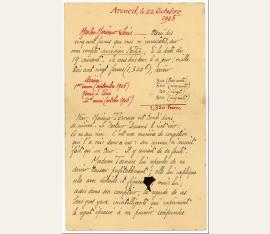 A ce soir […]“ - With full signature and address on the address page. French composer (1866-1925). 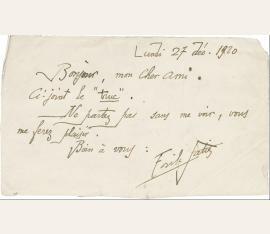 Autograph letter signed (“Erik Satie“). Acueuil. 8vo. 1 page. With autograph envelope. 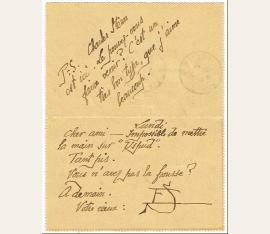 To his friend the writer René Chalupt (1885-1957): „Demain vendredi, j’airai besoin de ,Socrate’. Voulez-vous être assez gentil pour déposer – dans la matinée – cet ouvrage chez votre concierge […] ça marche votre écrit ? ,Grouillez-vous’ cher ami […]“. 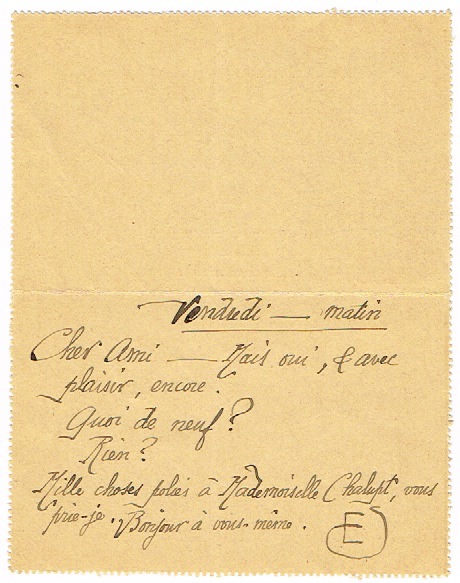 To his friend the writer René Chalupt (1885-1957): „Ai laissé vos petits poèmes chez Madame Bathori. Voulez-vous m’envoyer pour mercredi, une troisième copie du Md de Chapeaux? Excusez-moi […]“. French composer (1866-1925). 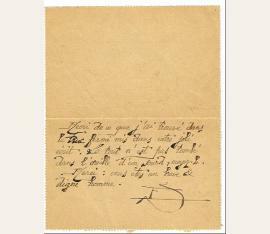 Autograph letter signed „ES“. [Paris]. Small-8vo. 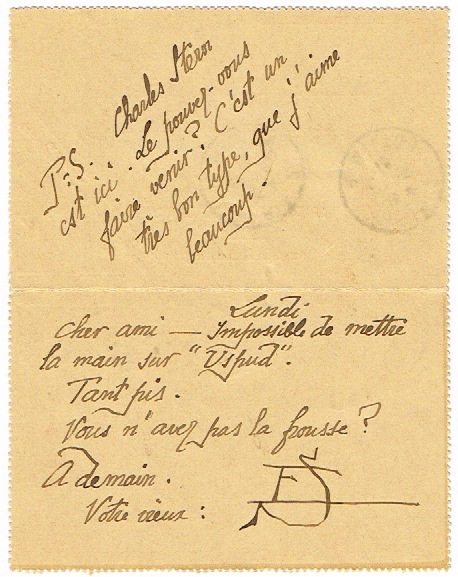 1 p.
To his friend the writer René Chalupt (1885-1957): „Impossible de mettre la main sur „Uspud“. Tant pis. Vous n’avez pas la frousse? A demain […] P.S. Charles Stern est ici. Le pouvez-vous faire venir? C’est un très bon type, que j’aime beaucoup“. 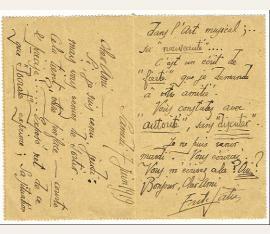 To his friend the writer René Chalupt (1885-1957): „C’est entendu: Lundi. 18 heures (ancien 6.h.). Bien à vous“. French composer (1866-1925). 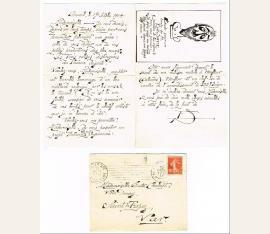 Autograph letter signed „ES“. Paris. 8vo. 1/2 page. French composer (1866-1925). 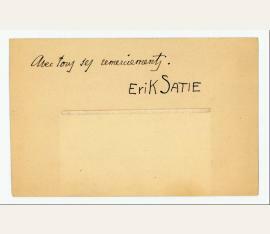 Autograph letter signed „Erik Satie“. Acueuil. 8vo. 1 page. franz. Komponist, Pionier der Neuen Musik (1866-1920). Eigenh. Billet m. U. 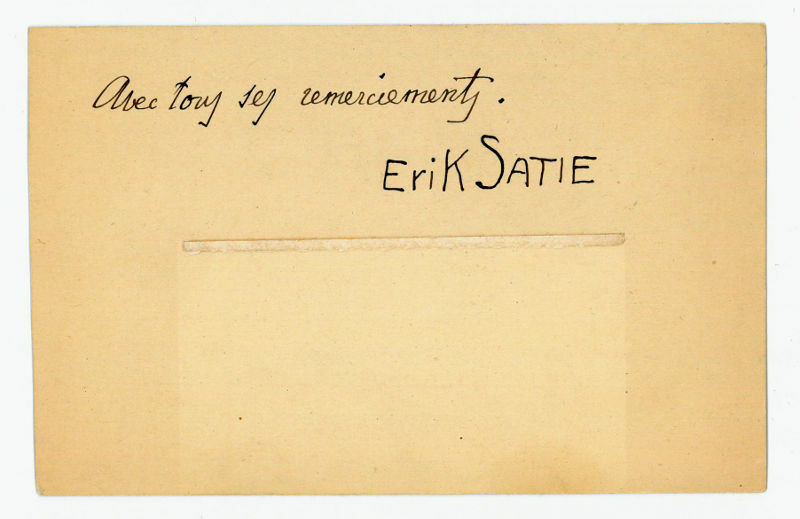 „Erik Satie“. o. O. 1 p. Auf einem Teil eines an ihn gerichteten Briefumschlags. 7,5 x 12,5 cm. An einen Freund. „[…] Ci-joint le 'truc'. Ne partez pas sans me voir, vous me ferez plaisir […]“. - In einem anderen Brief schreibt Satie: „Je viens de terminer le 'truc' pour la Dame américaine […] C'est de la musique d'Ameublement“. - Selten. pianiste et compositeur (1866-1925). Autograph album leaf signed. S. l. n. d. Une ligne autographe sur une carte in-12° oblongue. "Avec tous ses remerciements. 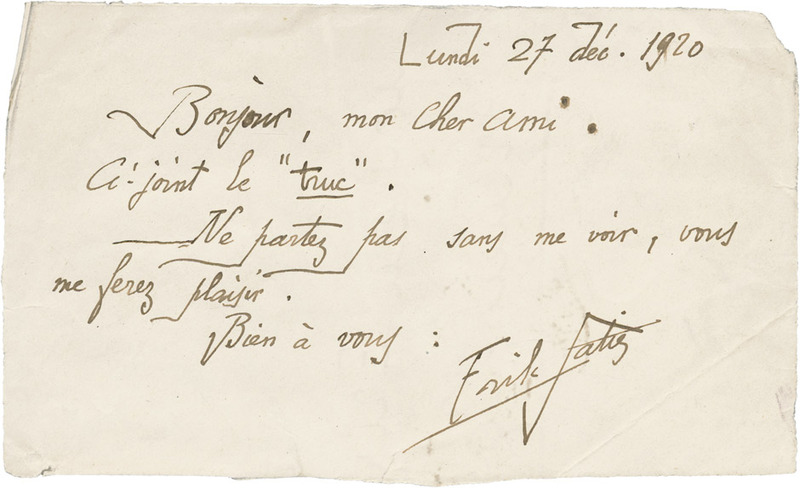 Erik Satie". - Traces of mounting. Erik Satie (1866–1925), French composer. AMusMsS. 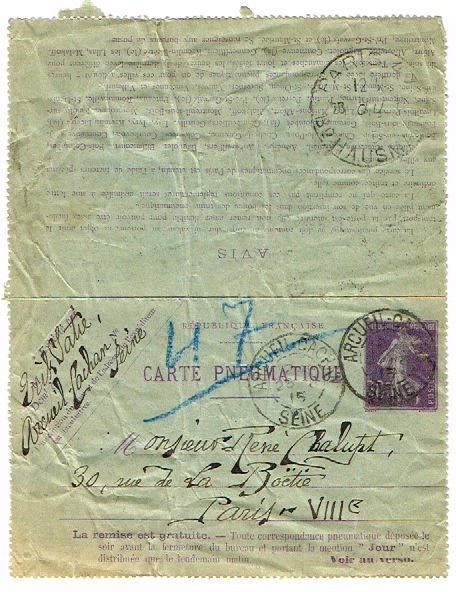 N. p., 15 May 1914. Oblong folio. 1 p. 12 staves. In black ink. Browned; small defects to two corners. 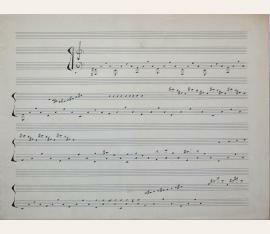 Engraver’s model for “Préface” and “Choral inappetissant”, from his piano work “Sports et Divertissements”. 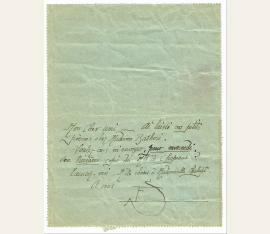 – Autograph music by Satie is of the utmost rarity. “Satie’s ‘Sports et Divertissements’ is among his most characteristic works. They are described by Rollo Myers as ‘a set of twenty brilliant little thumb-nail sketches of various out-of-doors sports and amusements [...] As it is they remain up to the present unchallenged and unique” (E. S., New York, 1968, p. 85 & 90). 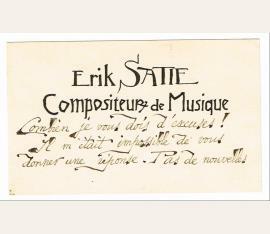 Erik Satie (1866–1925), French composer. AMusM. N. p. n. d. . Oblong folio. 1 p. 12 staves. In black ink. 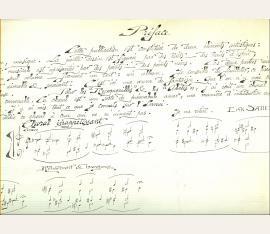 Engraver’s model for “his piano work “Sports et Divertissements”. 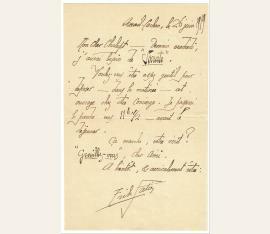 – Autograph music by Satie is of the utmost rarity. “Satie’s ‘Sports et Divertissements’ is among his most characteristic works. They are described by Rollo Myers as ‘a set of twenty brilliant little thumb-nail sketches of various out-of-doors sports and amusements [...] As it is they remain up to the present unchallenged and unique” (E. S., New York, 1968, p. 85 & 90). 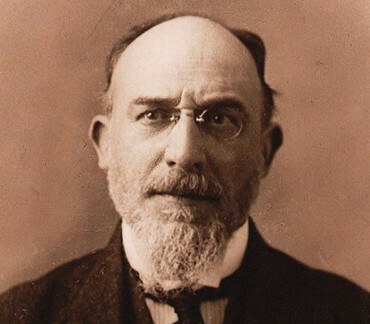 Erik Satie (1866-1925), Komponist. E. Musikmanuskript, o. O. u. D. [ca. 1914], 1 Seite quer-gr.-Folio. 12-zeilig. Doppelblatt. Schwarze Tinte. Leicht gebräunt. Sauber ausgeführtes Manuskript zu einem nicht näher bezeichneten Werk. – Musikmanuskripte Saties sind von großer Seltenheit. 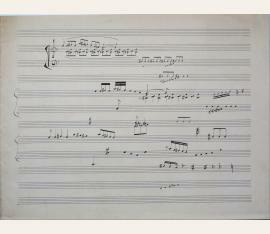 – Autograph music by Satie is of the utmost rarity. 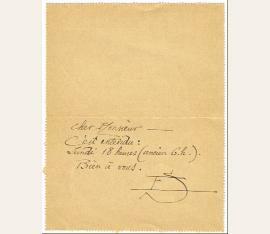 Deux lettres autographes signées, au Dr. Louis Lemonnier. 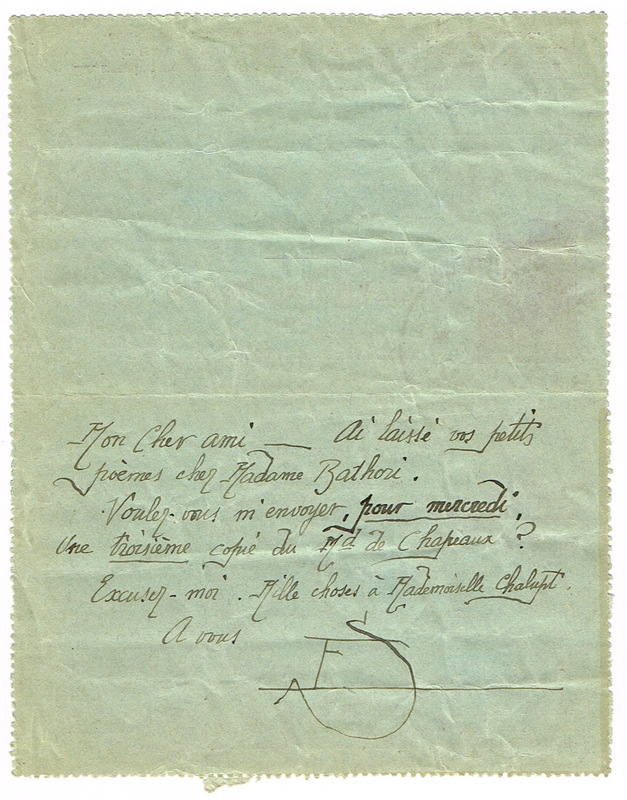 To Dr. Louis Lemonnier: "My good Monsieur Louis - Thank you for the five hundred francs that you have sent, to my account succession Fortin, dated 19th of this month. 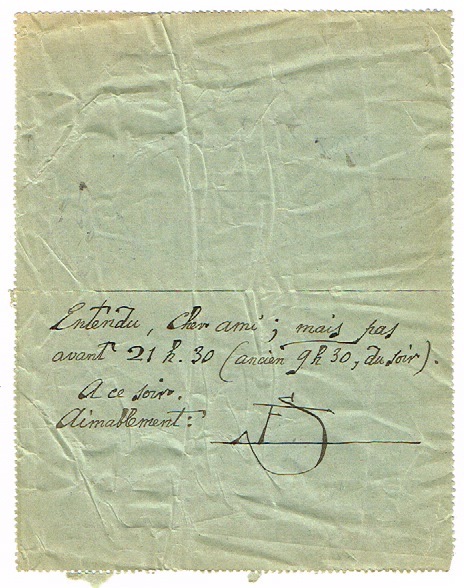 So, I owe you to this day, one thousand three hundred twenty francs (1,320 f.), that is to say: Overdue 300 (three hundred) 1st remittance (September 1905) 500 (five hundred) Remitted in Paris 20 (twenty) 2nd remittance (October 1905) 500 (five hundred) [altogether:] 1,320 francs. Yesterday, Monsieur Tornare had a fall in his kitchen. Doctor Durand came to see him. It is nothing. It is a type of congestion that made him in that state: his heart must have skipped a beat. It is though to be his fault. 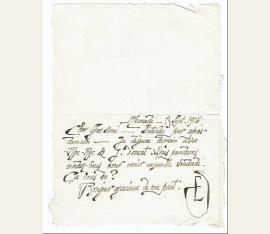 Madame Tornare reproaches him for not knowing how to cough to his advantage [profitably in text]; she explains that in details to him and with illustration [spot], but him, seated at his counter, looks at her with unintelligent big eyes expressing true regret for not being able to understand such simple theme. - 'But look at me', disagreeably shouts to him Madame Tornare. And him, still looks at the one he loves, hoping, no doubt, that his poor brain will shed light. Of course, Madame is not satisfied, and judges him inferior: - 'But look at me'. Then drily, harsh toned: - 'When you do not know how to cough nor look, don't talk'. Madame Tornare is a bitter Madame Geng, with no literature or philosophy […]" (22 Oct. 1905). - "My good old man - Very chic. 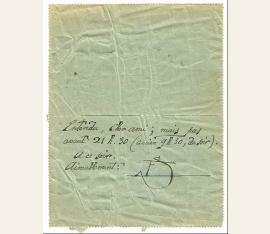 You can send the rest, that is to say seven hundred francs. Please deduct, expense for sending the money, I wish to pay for it. It is the least. Thanks for all you have done [fold] for me. You are a good fellow, very nice and kind. Thanks again. 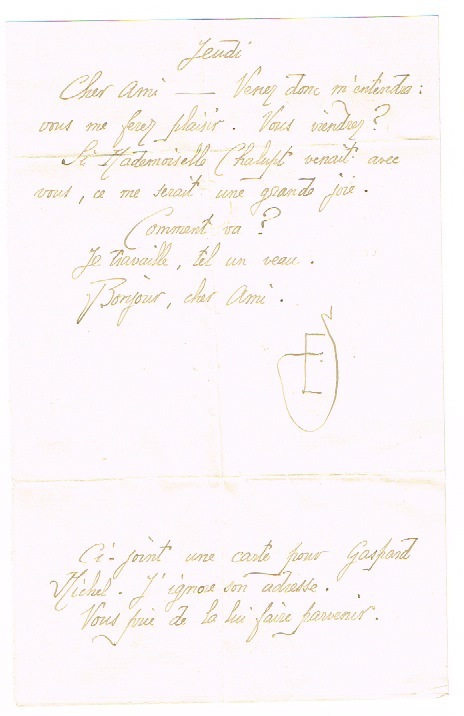 My respects to Madame Lemonnier" (2 Nov. 1905). Autograph visiting card with holograph additions with signature.